Offering a harmonious combination of function and beauty, the MK MAC is a backlit mechanical keyboard designed exclusively for Mac. The bead-blasted aluminum finish exudes elegance while underlining Apple’s minimalist aesthetic. Function keys are implemented for quick access to a variety of Mac features including Mission Control and Launchpad. Tactile and non-clicky in design, the MK MAC will change the way you type on a Mac. Experience precise travel distance and tactile feedback with every key. No more ghosting or conflicts with simultaneous key presses. Type with confidence with every stroke, every time. 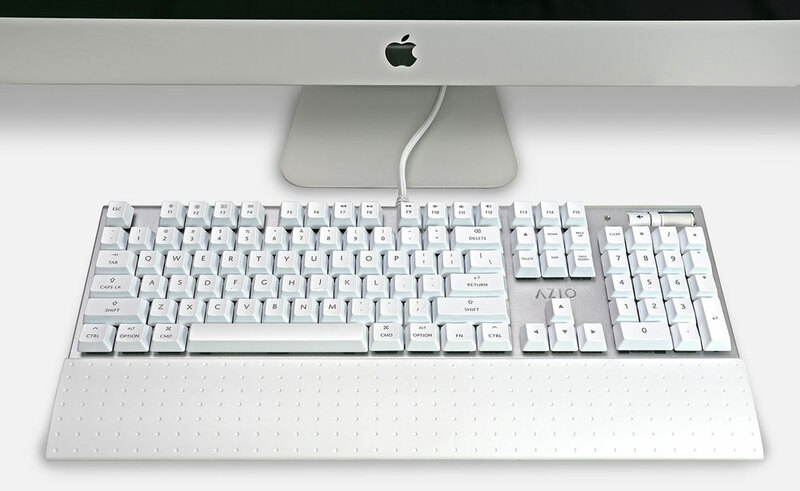 Finally, a mechanical keyboard made exclusively for Mac. Exposé, Dashboard, Media Control or Brightness Control... MK MAC’s layout is 100% designed to what you're familiar with. No more compromising or using something that would have, could have, or should have been. Crafted from top grade aluminum with CNC chamfered edges, diamond cut logo, and bead-blasted finish. Every detail of the MK MAC is fine tuned to perfectly match with your Mac. Combining convenience and ease of use, the dedicated on-board volume adjustment wheel and mute button gives you the command of sound whenever you need it. Intuitively roll the wheel to make it louder, quieter, or mute without having to look for command buttons on your screen. Convenient snap-on palm rest with matte UV coating provides comfort and durability. The inner-curve design allows the palm rest to fit the keyboard in both height positions, with or without the use of foot-stands.